If there is one thing Mini Me loves more than anything, it is small, collectable toys that can easily be smuggled in her school bag as contraband. There was never any doubt that she would not appreciate working on a Twozies review and vlog, especially as it would broaden her small toys collection even more! Twozies, the latest collectable toy, from Character Options and Moose Toys (the awesome people behind Shopkins) are an absolute hit in our house, as I knew they would be, the fact they are so cute is a major bonus! Twozies, available in Surprise Packs priced at £2.49, come with a random baby and pet in a small shadow box, alongside a pattern card to decorate the box and a collectors card to mark off which Twozies have been collected so far. With over 140 to collect, the aim is to match all the babies with their matching pet for Two-getherness. The Twozies range also features playsets that include two matching babies and pets, alongside the main item. The playsets we were sent try out were the Two-Sweet Row Boat and the Two-Cool Ice Cream Cart. 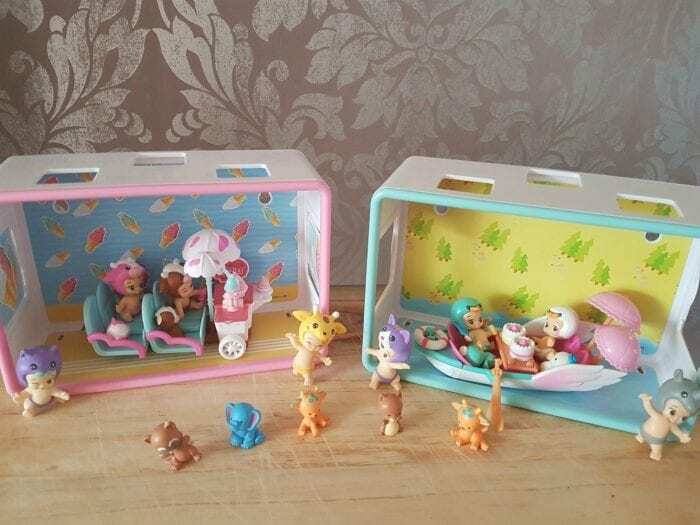 The Twozies playsets are presented in medium sized shadow boxes which can easily be stacked or mounted and feature cute accessories to further enhance the theme of the playset. The playsets are priced at a very reasonable £14.99 and I can imagine these will be very popular on Christmas lists! I found the Twozies and their related playsets to be really well made and the shadow boxes are very sturdy – I love the fact these can be easily stacked, giving the collectable toys even more merit! Mini Me is already head over heels with the collectables and has already put a request in if I see more in the shops. The range will definitely appeal to children who love collectables! The range of Season 1 Twozies products are available now and can be purchased from Toys R Us.